In the time since our last post, I had the opportunity to spend a few days in San Francisco. While I was there, I made a point to dine at Charles Phan’s Slanted Door because I had received his cookbook, Vietnamese Home Cooking, as a gift; not to mention that it is one of the most well-known restaurants in San Francisco. Eating at Slanted Door reminded me of the food that I grew up with and inspired me to actually make some from the cookbook when I returned home. 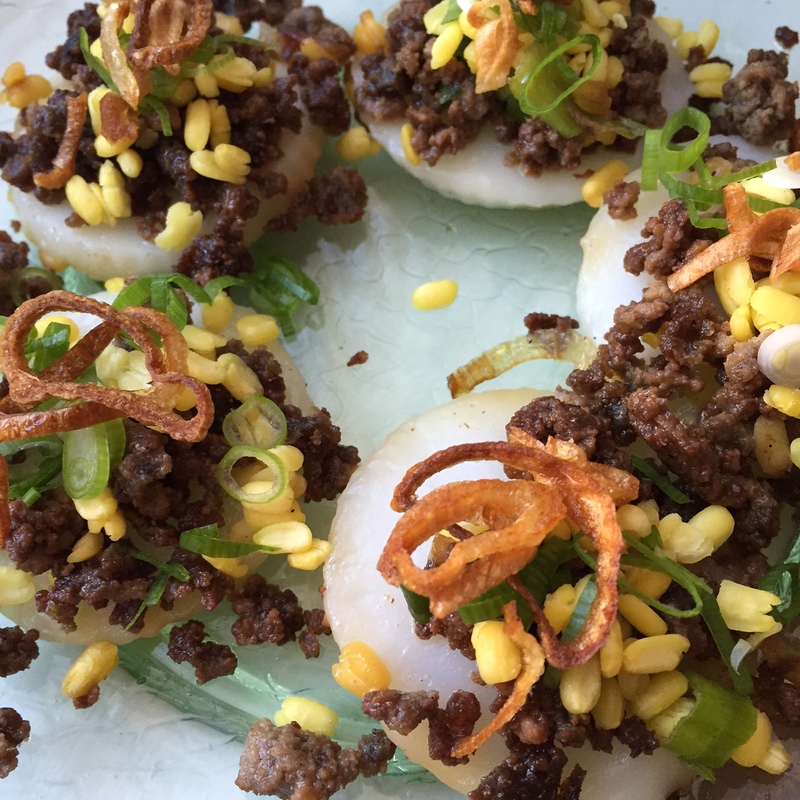 Thumbing through the cookbook, the image of his Bánh Bèo: Steamed Rice Cakes with Mung Beans & Shrimp caught my eye. When I was young, I’d always pick it as my snack of choice whenever I went to the Vietnamese market with my dad. Since my fiance is allergic to shrimp, I adapted it by making it with a beef topping and a rice cake mix. Place a heavy bottomed pan on medium-high heat. Combine the fish sauce, sugar and lime juice in a small bowl and set aside. 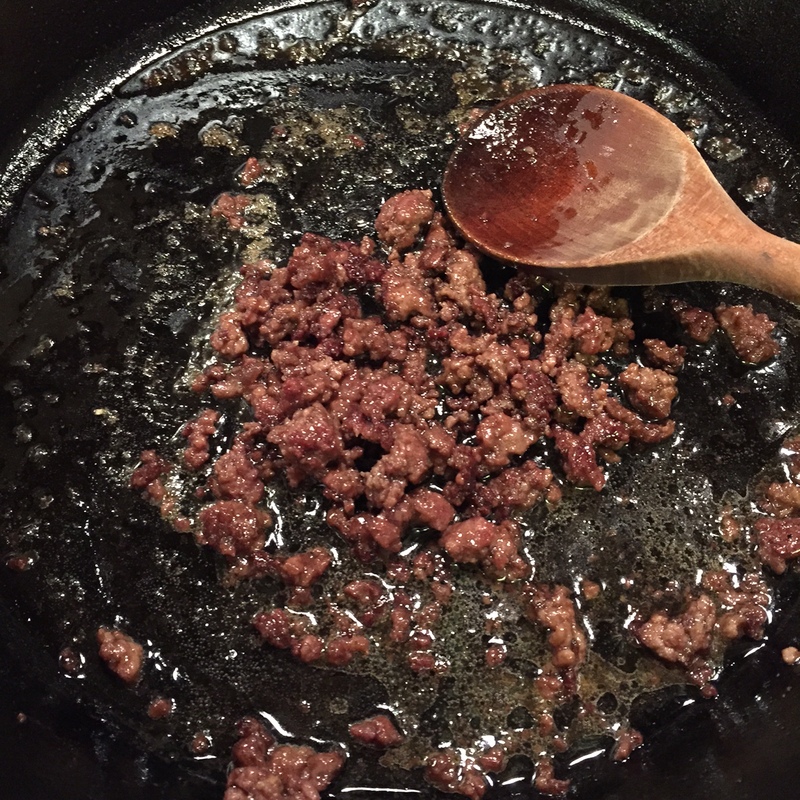 Brown the ground beef in the heated pan, breaking up the pieces. When its nearly cooked, add the sauce and allow it to evaporate. You’ll notice that the beef will start to caramelize due to all of the salt and sugar, at that point, remove it from the pan and drain on a paper towel. In a small sauce pan, heat the canola oil to 275 F (I learned this from Vietnamese Home Cooking) and add your sliced shallots. Allow the shallots to cook until brown. Phan recommends frying the shallots twice: once at 275 F and once at 350 F. I found that allowing them to cook at 275 F until brown was sufficient for me. Remove the shallots from the oil, place on a paper towel to drain, season with salt and set the shallot oil aside. Resist the urge to eat them. 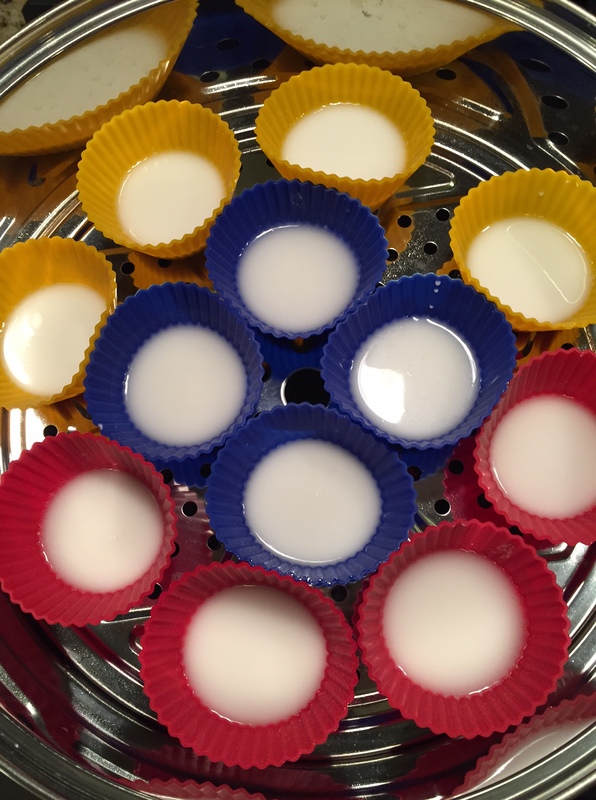 Follow the instructions for the rice cake mix or if you can’t find the mix, follow Phan’s instructions here. In order to steam them, I filled silicon muffin cups with the mix and placed them into the steamer. Each batch took about 15 minutes to steam. If you have a mini muffin tray, they will cook faster because the metal will heat up rapidly to cook the rice cakes. To assemble, place the rice cakes onto a plate in a single layer. Sprinkle the beef and shallots over the top. 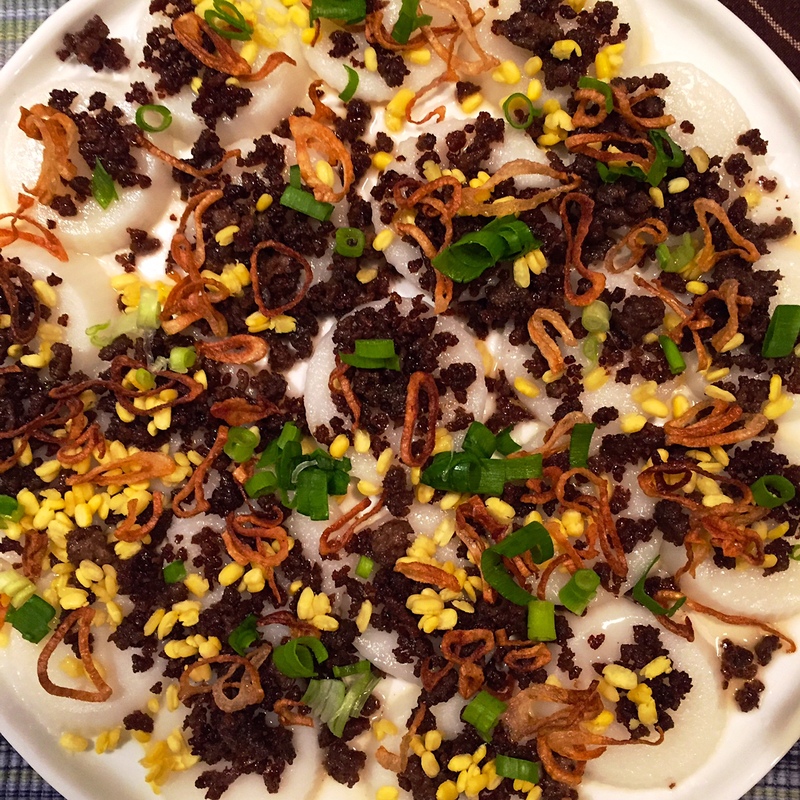 Mix the green onions and steamed mung beans into the Nước chấm and spoon over the rice cakes and drizzle over with the shallot oil.